Asparagus with Lemon and Olive oil, or asparagi all’agro, is one of those dishes that is so quick and simple you might argue it hardly needs a recipe. But simple doesn’t necessarily mean easy or obvious. In fact, simple dishes can be quite tricky to pull off. The very simplicity leaves you with nowhere to hide, so to speak—use a lesser quality ingredient or faulty technique and you can wind up with a mediocre dish. But no need to be daunted. This dish doesn’t require you to be a master chef, you just need to pay attention to detail if you want to enjoy it at its best. The all’agro technique is one that, for me, typifies the simple elegance of Italian cooking at its best. The asparagus are cooked until just tender—not “crisp-tender” in the Asian manner but fully tender, with some bite. They are then dressed with an emulsion of lemon juice and olive oil, seasoned with salt and pepper and, if you like, some fresh herbs. 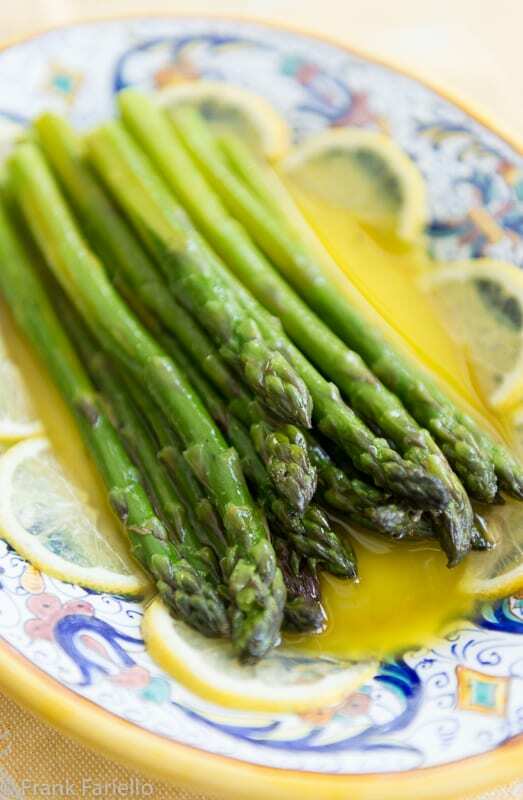 You can serve your Asparagus with Lemon and Olive oil as a side dish or a light antipasto. Take your asparagus cooker (see Notes) and pour in enough water to come up about 5cm/2 inches up the sides. Add a generous pinch of salt. Turn on the heat and when the water comes to a boil, place the asparagus in the cooker basket, tips upward, and insert the basket into the cooker. (Take care not to scald your fingers!) Replace the cover. Steam the asparagus for about 5 minutes or so, until just tender. 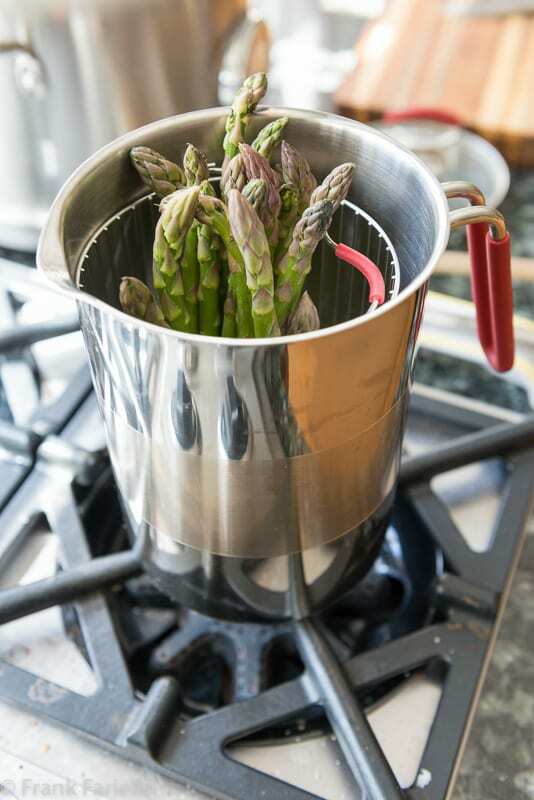 Remove the basket from the cooker, and let the asparagus cool and drain on a counter. 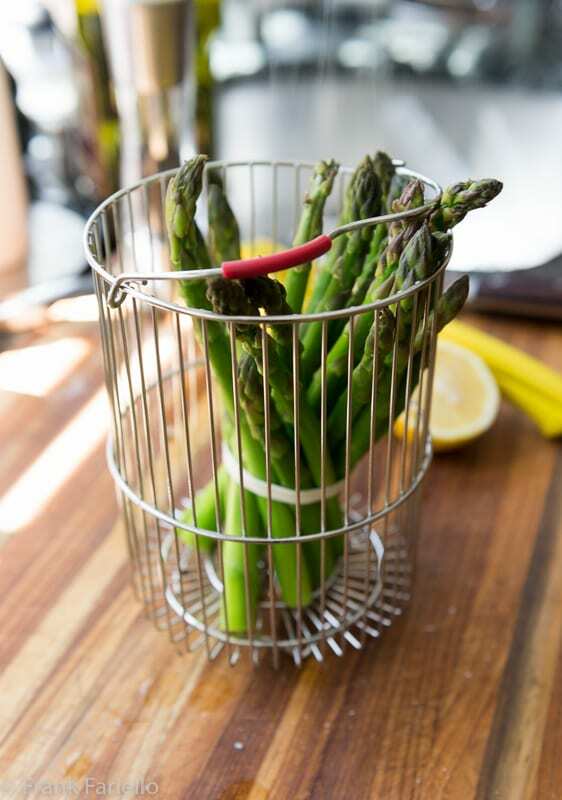 When the asparagus have cooled off but are still a bit warm, remove them from the basket, untie them and arrange them on a serving plate, in layers if necessary, spooning the sauce over them, making sure that all the layers gets a bit of sauce, all up and down the spears. Serve with additional lemon wedges on the side for those who like their asparagus tangier and, if you like, sprinkle over some fleur de sel. I usually just boil asparagus loose in a saucepan or open skillet, but for this dish a special purpose asparagus cooker, as shown in the photos above, is really useful. It allows the thicker bottom ends of the spears to boil fully immersed in water, while the middles and tender tips gently steam, giving you a more evenly cooked vegetable. And since most the spear is steamed, not boiled, there is less risk of it becoming water-logged. The asparagus will better absorb the sauce. But if you don’t have a special purpose asparagus cooker, no worries. Just boil your asparagus in well salted water, then make sure to drain them very well. Here in US, green asparagus comes two ways: the thinner ‘pencil’ asparagus and the rather thicker regular asparagus. For many dishes, especially for frittata, I like the thinner variety rather better. It also has the great advantage that thin asparagus generally doesn’t need peeling. But for this dish, I prefer the meatier regular asparagus. White asparagus, invariably thick, is harder to find and pricey when you do, but if you do come across them, this is fine way to enjoy them, too. I love the simplicity of a plain lemon and olive oil sauce, with just salt and pepper for seasoning, but you will find recipes that call for adding finely fresh herbs like parsley or basil. And for savor, you might also add just a bit of finely minced garlic. And you will find all’agro recipes that call for white wine vinegar in lieu of lemon juice, but personally I much prefer lemon’s sprightly zing. Technique can vary, too. 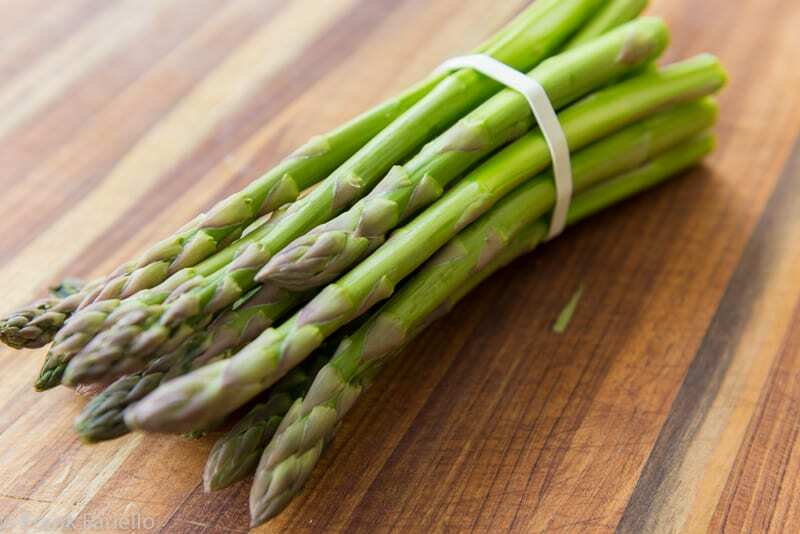 Rather than making an emulsion, you can dress your asparagus in the usual manner of Italian salads, adding lemon juice and oil separately, then seasoning. Other vegetables can be served all’agro. Way back in the early days of Memorie di Angelina, we showed you how to prepare green beans all’agro; spinach and Swiss chard are also classic choices, but really most vegetables can be enjoyed this way. A wonderfully simple yet delicious dish that screams springtime. I remember foraging for wild asparagus with my parents when I was young, but alas, you never see it by the sides of the road anymore. Still, New Jersey asparagus is pretty wonderful in the spring. Wonderful memories, Linda. And I thought that wild asparagus was just an Italian thing! Beautiful! I want one of those pots! Definitely worth it. And not at all expensive, either! Yes, indeed, asparagus are especially popular in the North, although I understand that much of the actual production is down South. Thanks for stopping by, guys! A true expression of springtime! The past week in Italy we have been enjoying all varieties of asparagus – wild, green and white. Presenting them in all of their splendor as you have allows the flavor to shine through. Ah yes, wild asparagus is one of those things I miss most about the Italian food scene. Lucky you! fatti così semplicemente mi piacciono molto, accompagnati da uova sode sono il massimo ! Buon we Frank ! Not quite local asparagus season here yet. I really like the idea of making the emulsion and for me, there’s nothing like lemon with asparagus. Our local stuff is so good…and I find the bigger stalks sweeter, that I simply snap off the ends and don’t peel. Can hardly wait for them to show up at our favourite farmers market! I can imagine your anticipation, Phyllis! Nothing like spring vegetables, if you ask me. And we’re getting to asparagus season! I love the simplicity – because it lets the asparagus be the star. I don’t have an asparagus cooker but I can steam or gently saute them. After years of buying skinny asparagus, I’ve recently become fond of the thicker ones. Yes, I agree, there’s a place for both kinds on my table, depending on the dish (and my mood). Ah, Christina, you and me both. It can be very disheartening. For that reason alone, I hardly go into Pinterest any more. Can’t take it! Asparagus doesn’t need a whole lot to make it taste delicious. I love your simplicity. I don’t have an asparagus “cooker” per se but I do a gentle sauté in a skillet with a touch of broth or white wine. Your presentation is beautiful, Frank. We are having asparagus tonight 🙂 Buon fine settimana.